If you want to use balsamic vinegar, use the same amount of vinegar as you use olive oil. Put the ingredients into a jam jar, close the lid and shake. Alternatively, you can use a blender. 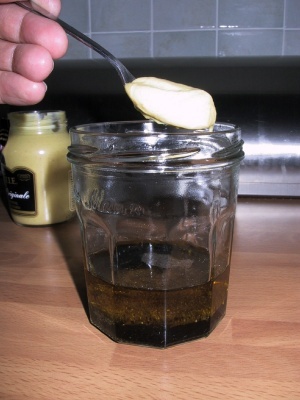 Use an old jam jar - pour the olive oil + vinegar into the jar. Add some salt, pepper and a tiny bit of sugar. Add one teaspoon of Dijon mustard. Close the jar and shake it well - finished! Keeps in the fridge for a couple of days if you want to make a bit more. I've added some dill tops here which makes a nice addition. 8 What a GREAT idea! I make my own salad dressing all the time and have never thhugot to do this. Of course Mr. Pepin teaches this trick, he's such a wizard My husband and I watch his show all the time! 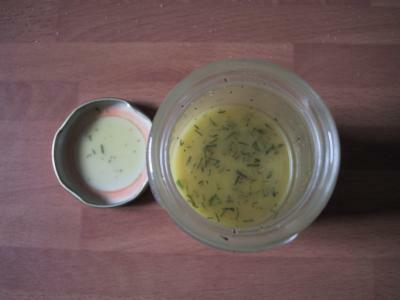 10 I tried it with the fresh dill tops & substituted the vinegar for fresh lemon juice. Then I poured it over a whole fish( with a few slices in it & wrapped in foil) & baked it. HEAVEN!!!!!!! 10 Simple is best and so tasty! 10 Wow! Easy and very tasty!!! 10 So simple, so easy to make and so tasty....mmm! 10 i tried this for the first time today.it is by far the most scruptious dressing i have ever tried. 10 Worked great! Recommended ! 10 this is my fave salad dressing! 10 Great. Instead of salt, try a crushed caper, for something different. Might try anchovy next time as well. 10 Great! So easy to make for those of us who aren't whiz's in the kitchen! 9 Excellent. Try making it with a good Chardonnay, instead of vinegar, as a sauce with Monkfish. Serve with pine nuts. 10 How clever are you? Put it in a jar and shake it - excellent! Done it in an old Dijon mustard jar, so even "authentic" - many thanks! 9 Excellent, it looks almost good enough to eat. 10 Fanastic! Short, Sweet and to the point! 10 Superb! I used Belzu balsamic and the same brand olive oil. Deeeeelicious!! !